I photographed the sunflower field below in the foothills of Yercaud. Located about 300 kilometers away from Chennai, it is the second nearest hill station from home. Only Yelagiri is closer. All I have to do is drive down Koyambedu, take the Chennai-Bangalore highway and stock up on hard candies. A few hours later, I could be sitting on a moss-covered bench amid a gathering of trees in Yercaud’s peaks. I haven’t visited this hill more than a handful of times. She seems too wounded to be a source of comfort. Corrupt authorities, greedy locals and tourists have had their ways with her. Now she coughs more than she cajoles, choking on billows of smoke and plastic. Every time I go to Yercaud I come back feeling bad about it. Except the first time I had visited her. I have a warm memory of her from my Don Bosco schooldays. My school used to organize scout camps every summer in the nearby hill stations. We visited Parambikulam, Ooty, Kodaikanal and some places in Kerala. Sometime in the mid- Nineties, we went to Yercaud a few days after summer holidays had begun. During the trip, we were told that we would be visiting a local silk farm to learn about the process of silk production. I wasn’t happy about it. All I wanted to do since we had gotten there was to run around and explore the place. See if there was anything interesting to jump off from. Look for strange objects on the ground. Show off how well-synchronized I was during the march-past. A silk farm tour sounded like no fun at all. By the end of it though, I wanted to be there all day. I was depressed that I had to leave. It was as though I had connected with something in particular about the farm. Unfortunately I don’t remember anything else. Not one single thing. I can’t even recall the silkworms! I only know that the experience had left me with a lifelong supply of warmth and gentleness. Even these days, I feel happy and light-headed whenever I think about it in any context. I close my eyes, try in vain to connect vibes with visuals and drift into a peaceful state. I am going to visit the silk farm sometime this winter. Perhaps I will find a few more reasons to visit her again instead than rationalizing the one I already have. you review the kitchen sink too. sheesh. like i said before, big fan! I love the idea of being a “spoonful of amuse-bouche” 🙂 ! 🙂 i wrote nursery rhymes on crack at your age, if i had a time machine – i’ d be jealous of you! Haha, NO! I’m pretty sure that even if I had a time machine, I’d still be jealous…in a good way as in an inspiring jealousy…what. Beautiful, I love the Sunflower. 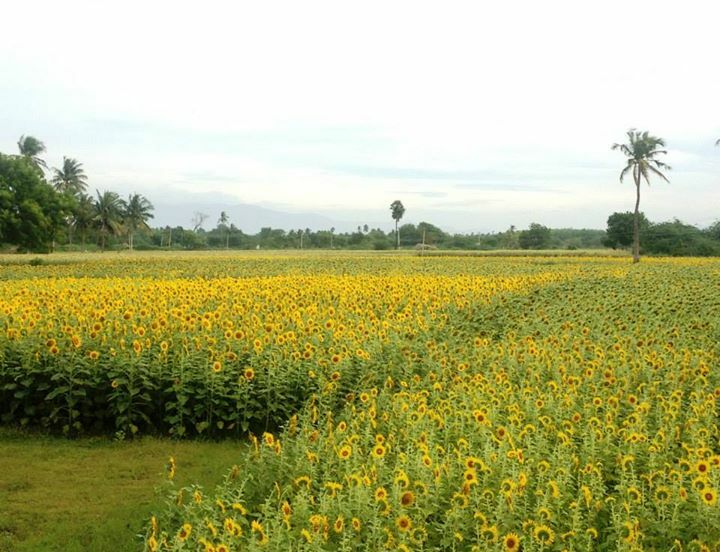 Valley of the smiling sunflowers. 😀 Vunderful! sunlight dripping, like sauce, from your cheekbones… I doubt I will ever come up with a line like that. Take a bow Bird-Bard. It was a captivating accident, bud. We stopped for tea and stumbled into it! Ha yeah I don’t know what I was thinking! That being said we shouldn’t get excited around broken glass. Unless we are wearing bubble suits. Oh! you are so very eloquent! Lend me your tongue for a day, would you?! Jk! Thanks adi. Lend yourself the liberty of seeing a sunflower, the writer in you will take care of the rest! Judging from your superb photos, she doesn’t look ‘wounded’ at all. You’ve no doubt nicely cropped out the smoke and trash for your viewers pleasure. Sunflowers are always the happy flower, but when I see them in mono-culture (purposely planted, all in rows for farming), my smile turns down just a bit. Yeah I edited the bad parts out for the sake of prosperity I suppose hehe. Thank you for bringing up mono culture. It didn’t strike me at all, yeah not good at all! Giggles, how marvellous! Sounds like an adorable short film <3!